The Fender American Series: Evolution of a Revolution: "A Fender American Series guitar is set apart by features such as rolled neck edges, which makes it feel like you’ve been playing it forever. Then there are the staggered tuning machines, which eliminate a string tree, yet still provide a sharper string-break angle over the polished nut for improved performance." Yeah, never mind all that... is that a hardtail Strat I see on the left in the photo? A doubleneck travel guitar? Isn't that an oxymoron? This tribute to Jimmy Page's Gibson doubleneck is part of Fernandes Guitars' new Art Rock series featuring 60/70s Rock Legend flavoured variations of their popular Nomad travel guitars (with built-in amplifier). As well as the Two Heaven model shown above there is another Led Zeppelin-themed guitar, the Kashmir which is a Fernandes Nomad with a Danelectro DC-50 twist (lipstick pickup, "seal" scratchplate), and also one for Eric Clapton fans, the Sunshine Love which pays homage to Clapton's psychedelic Gibson SG. The series is completed with two basses - the Sunshine Love Bass and the Ladyland Bass. Guitar worth £35,000 goes on show in store in Northampton: it's another doubleneck, kids. What a pity it's a PRS. 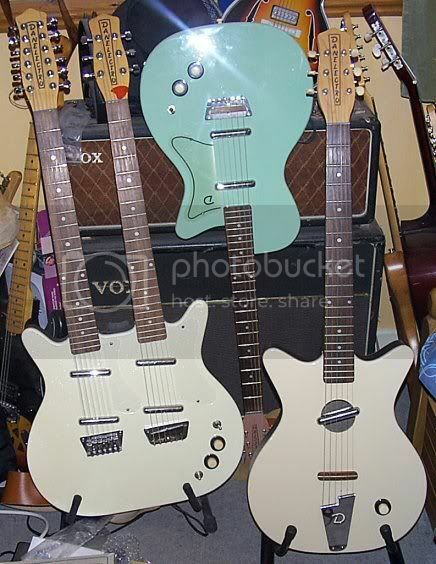 I've just waved goodbye to the Danelectro Convertible (above, right). It was a lovely guitar, but when I bought the doubleneck I made the decision that one of the other Danos had to go. I'd love to keep them all but I'm running out of space for all these guitars, so sometimes I have to adhere to a strict "one in, one out" policy when buying guitars. It was a tough decision deciding which of the Danos to get rid of. In the end I decided to keep the 56'U2 because that is one I put together from the remnants of two broken guitars, and therefore is much more personal to me. Anyway, I hope the Convertible is going to a good home. Line 6 Offers Variax 700 In Two New Colours: Big wow! It's still as ugly as sin. Is it any wonder that people are taking the guts of Variax guitars and putting them in, for example, Squier Stratocaster bodies? Kinks guitarist hopeful of reunion: Kinks guitarist Dave Davies is hopeful he can persuade his brother Ray to agree to reform the legendary British band. Guitar Musician News :: Lessons :: Hey Guitar Players! Can You Play the Blues? Guitar collector scores rare finds as he travels the globe seeking out new treasures: introducing Peter Blecha the rock'n'roll archaeologist. Guitar Musician News :: Lessons :: Learning The Guitar Fretboard: Do you know what notes are where on your fretboard? Fender Custom Shop Recreates the 1955 Strat: Fender Custom Shop has recreated the 1955 version of the Strat in a limited edition run, exactly fifty years on from the original. Former Jimi Hendrix bandmate accuses author of 'revisionist history': Billy Cox sets the record straight. Brian May Joins Yamaha Guitar Artist Roster: No, don't panic he's not retiring the Red Special! He's been using the Yamaha SLG100 silent guitar for live acoustic work. I myself tried one of these guitars at the London Guitar Show earlier in the year and was quite impressed with the sound. SimS Custom Shop: A great site showing guitar customisation projects by Martin Sims. Check out also their now legendary SimS L.E.D.s! Phat Axx Overdrive Added to Indyguitarist's Pedal Line: "Available in either a diamond plate or more affordable Hammond enclosure, the Phat Axx adds a bass boost switch to its standard overdrive controls." I bet they're kicking themselves they didn't think of the skull knobs thing first. Wicked Metal Pedal from Audiotech: "Designed for extreme distortion sounds, Audiotech's upcoming pedal comes complete with skull knobs." How absolutely wretched. International Superstar Soraya Chats With Epi: Epiphone interviews another person I've never heard of. An Interview With Edsel Dope (never heard of him), courtesy of Epiphone. 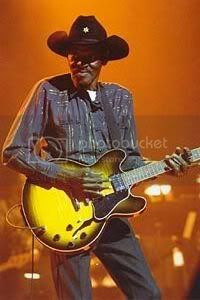 Texan Blues star Brown dies at 81: Grammy-award winning guitarist and singer Clarence 'Gatemouth' Brown has died in Texas at the age of 81. Nicknamed "Gatemouth" for his deep voice, he cited his father, a railway worker and fiddle player, as his greatest musical influence. "If I can make my guitar sound like his fiddle, then I know I've got it right." Yamaha introduces new guitar and bass GigMaker packages: great for beginners. Seven effects pedals from TC Electronic: vintage tremolo, vintage delay, and vintage compression pedals as well as four different flavors of vintage overdrive and distortion for both guitar and bass. Signed Les Paul guitar auctioned for Katrina relief: Gibson donate classic guitar for Ebay auction. American Capital Provides Up to $52.5 Million to Gibson Guitar: Cor! What do they need that money for? Guitar Musician News: Tuning your guitar the right way: You could have been doing it wrong all this time! ratemyaxe.com is relatively new to the web, but has potential as quite a nice little guitar gallery/community. Go on - register and post some pictures of your guitars. I'm certainly going to do so myself. Is it just me that finds new product news about fuzz boxes (see two such examples below) particularly dull and unexciting? I mean, I've now got so many devices for overdriving the guitar, that there's simply too much choice, and it ends up getting in the way of the actual playing, the actual music. Ozzy Osbourne & Zakk Wilde: Do they have a future together? Guitar man is passing on skills with wood: A Bath-based wood-worker is helping young unemployed people make a fresh start by teaching them how to make guitars. Guitar Musician News - Why Play Guitar? Phil Lynott Statue Unveiled: After months of campaigning by Thin Lizzy fans and Dublin residents, legendary bassist and vocalist Phil Lynott has finally been immortalised in bronze. Gretsch UK Tour - September 2005: Mike Lewis, International Marketing Manager of Gretsch guitars, will be hosting the tour where he will be presenting and demonstrating the finest collection of Gretsch guitars ever seen in the UK, including the USA Custom Shop Models. Do you remember the Williams Keyboard Guitar that I briefly commented on last year following its appearance at the Summer NAMM show? Well, they've now got their website up and running at www.keytarinc.com. I still think it looks very silly, but wonder what anyone who's ever tried one thinks of its playability? (Don't ask me, I'm not a keyboard player). The Stones: still rocking, still controversial: In an exclusive interview at the start of their world tour, rock legends The Rolling Stones talk about life on the road at 60-plus years, US politics and why they didn't play Live 8. I've been away for a few days, but have just noticed - this blog is now over three years old! This guitar man doesn't mind 'roadie' tag: Alex Alvarez, guitar tech for Mick Jagger, Los Lobos, Lenny Kravitz and others.